Lonely Planet: The world's leading travel guide publisherAnyone can speak another language! It's all about confidence. 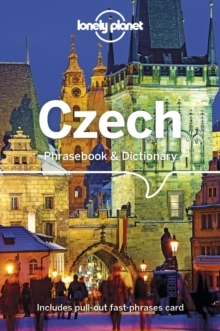 This book will give you all the practical phrases you need to explore the countryside, visit Golden Prague, and tour castles and mountains worthy of the Brothers Grimm (in fact, the 2005 movie of that name was filmed here). It also contains all the fun phrases you need to connect with local people and get a better understanding of the country and its culture. Never get stuck for words with our 3500-word two-way dictionary Order the right meal with our menu decoder Avoid embarrassing situations with essential tips on culture & manners Coverage includes: Basics, Practical, Social, Safe Travel and FoodLonely Planet gets you to the heart of a place. Our job is to make amazing travel experiences happen. We visit the places we write about each and every edition. We never take freebies for positive coverage, so you can always rely on us to tell it like it is. Authors: Written and researched by Lonely Planet and Richard Nebesky. About Lonely Planet: Started in 1973, Lonely Planet has become the world's leading travel guide publisher with guidebooks to every destination on the planet, as well as an award-winning website, a suite of mobile and digital travel products, and a dedicated traveller community. Lonely Planet's mission is to enable curious travellers to experience the world and to truly get to the heart of the places they find themselves in. 'Lonely Planet guides are, quite simply, like no other.' - New York Times'Lonely Planet.